Another completely original design from Big Dog Steel. Designed with both the outdoor adventurer and back yard burner in mind. Our fire pit is hexagonal in design for a more efficient use of your space. 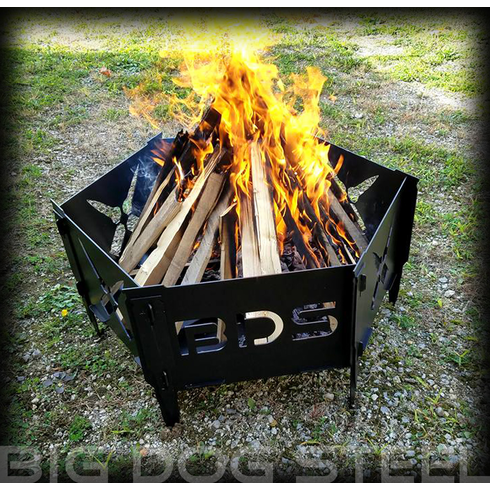 While the BDS fire pit may look similar to outher pits, it has one feature that most do not, it can be taken apart and put together without tools! How it works ... 6 heavy duty 11ga panels are clipped in place to a bottom panel. Once the panels are locked into place with the supplied "bullet" panels they are so secure that the pit can be bumped, kicked and practically thrown without the locking panels working free. However, when its time to move camp sites, pack up or clean up, the BDS Pit comes apart easily to store completely flat. What's even better is that you can customize your Fire Pit. Simply add your last name, first names, etc in the comments section of your order. We can add up to 12 letters to (2) panels to customize the fire pit to you and your family. Pits are available with our killer crossed bullets or Elk Panels.